As electronic books become more of a mainstay thanks to Amazon's (AMZN) Kindle and Apple's (AAPL) iPad, the publishing industry must address one of the thorniest issues of a digitally inclined reading world: How do they protect their books from pirates without alienating loyal customers who just want to read their e-books when they want to, wherever they want to? Finding an answer that satisfies both sides of the equation just got a lot more complicated, thanks to the Library of Congress's newest edict with respect to exemptions from the Digital Millennium Copyright Act, or DMCA, which governs how companies large and small go after those who willfully flout copyright and copy-protection. Every three years, the Library of Congress relaxes the rules on what digital lock-cracking situations are actually legally okay, and while the biggest stir surrounds their approval of jailbroken iPhones and the right to upload short DVD clips for non-commercial use, this cycle also directly affects e-books, whose market share of the entire book industry now hovers around 9% to 10%. Specifically, the Librarian of Congress points to a specific category class that has caused endless teeth-gnashing in the book world. That category is text-to-speech, which is a godsend for readers who are blind or have other disabilities affecting their ability to read. 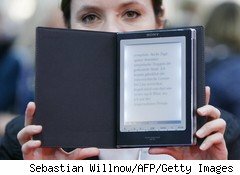 When Amazon first released the Kindle 2 in February 2009, the device featured text-to-speech capability that infuriated big publishers, because they said that text-to-speech for e-books would cannibalize audiobook sales. Amazon capitulated, and all subsequent Kindles disabled the text-to-speech function. Nearly 18 months later, e-book sales far outpace audiobook sales anyway, and the departments of Education and Justice suggested in a strongly worded joint missive that schools using Kindle devices on campus should be deterred from doing so because the devices -- lacking text-to-speech capability -- essentially discriminate against disabled students. Now the Librarian of Congress has delivered another nail in the anti-TTS coffin, ruling that digital rights management, or DRM, should be relaxed for "literary works distributed in e-book format when all existing e-book editions of the work (including digital text editions made available by authorized entities) contain access controls that prevent the enabling either of the book's read-aloud function or of screen readers that render the text into a specialized format." Or in plain English: Enabling text-to-speech on an e-book is fine if that's the only edition available, and in fact, such enabling should be the norm, not the exception. This means that if there's a way to flip the proverbial switch on an e-reader to get text-to-speech working, then go right ahead. And as a publishing insider with legal expertise informed DailyFinance, you don't even have to be disabled to get the text-to-speech function -- it appears the Library of Congress edict "would protect anyone who is circumventing the DRM even if it is not to enable access (i.e, you don't have to be vision impaired to be protected by the exemption even if that is the basis for the exemption)." The caveat to this exemption, according to Ars Technica, is if e-book vendors "offer any sort of version that allows screen-reading or text-to-speech, even if the price is significantly higher." Customers must buy the more expensive DRM-bound version and can't choose a cheaper version that allows them to get around the digital locking restrictions. And the exemption itself has a short shelf life: the Library of Congress edicts are for three years, but because they took so long to get these new rulings out, they will have to start holding hearings on the next set of rules two years from now. If DRM circumvention to turn on text-to-speech is successfully protested, that category might disappear altogether. Until 2012, however, the Library of Congress's missive is a big win for text-to-speech fans and for Amazon. The timing couldn't be better for the retailer, just a week removed from its announcement that it sold more e-books than hardcover books on its website and its move to garner backlist jewels from literary agent Andrew Wylie for exclusive distribution for the next two years. What's more, when that long-rumored next-generation Kindle finally appears on the market, you can be sure it will have text-to-speech.